Taishan is one of the most revered and visited mountains in China. The Chinese come here in their droves to scale its 6660 steps, light incense sticks along the route and tie red ribbons to trees to help bring their family good luck. 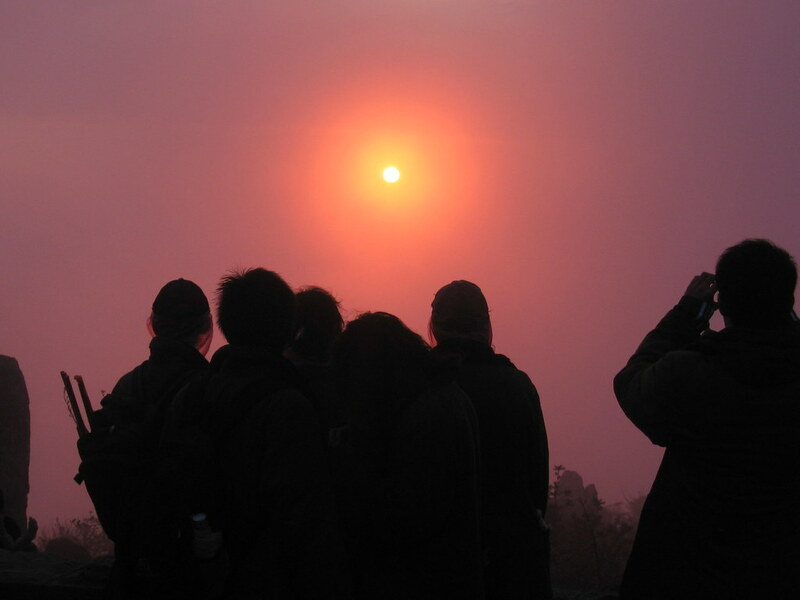 The aim is to reach the top to witness the most magnificent sunrise emerging from the East. "The East is red," Chairman Mao proclaimed from the top. We left for the top at 11pm - the sunrise was due at sometime after 5am. You wouldn't believe how many people were there armed with torches and high spirits, attempting to scale the steps, the steps, the steps, the steps, the steps. There were an awful lot of steps! At the midway gate we bumped into a young lad from London called 'A'. We stopped and took a rest for a couple of hours and he taught me how to play Chinese chess. What a fantastic game, I am hooked! We reached the summit, just before 5am (and most of the other sunseekers). It was cloudy, freezing and dark. "I need my bed," we all proclaimed from the top. After teasing us for another 10mins the sun finally revealed itself. It was amazing. I would like to dedicate this 'sunrise' mixtape to Russell and Nichola who have just had a wee girl called Orlynn. The last track's especially for you Russell.